When I was a little girl, my grandmother and mother used to make these thin, crisp cookies that almost resembled a waffle, and they were called Pizzelles! These ultra-thin cookies were flavored with vanilla, anise or lemon and then sprinkled generously with powdered sugar. My siblings and I loved these treats, but my family only made them during the holidays. Fast forward to present day, and I have children of my own. They too, love these addicting crisps. But I make them year round and flavor them to go with the season; Lemon or Orange in the spring and summer, pumpkin or maple in the fall and vanilla, anise, almond or chocolate in the winter. on-line than finding them in stores. Although the press resembles a waffle iron, do not try to substitute a waffle iron. These Pizzelles make a wonderful gift, as they are beautiful to look at all stacked and dusted with powdered sugar. And, they stay for days wrapped in an airtight container. You can buy pizelles in the bakery aisle of most supermarkets, but they can’t come close to tasting like the homemade version. In a small bowl combine the flour and baking powder. In a large bowl mix the butter, sugar, eggs and vanilla together. Pour in the flour and baking powder and stir to combine thoroughly, but do not over mix. Using a pastry brush, butter the grids on the top and bottom so the batter will not stick. 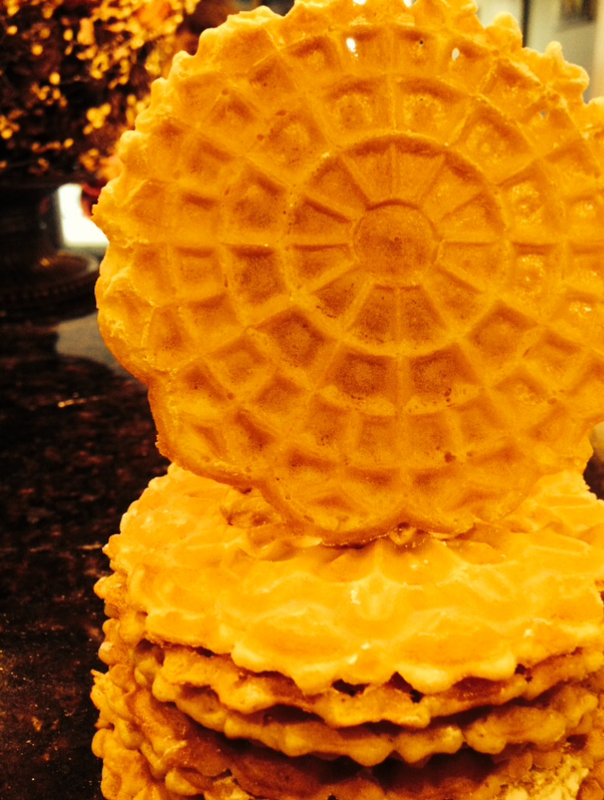 Drop 2 teaspoons of batter on the bottom of each pizzelle grid. Press the lid down on the pizzelle machine. Most pizzelle irons have a signal that sounds when the cookies are done and you can open the iron. Read the directions that come with your pizzelle iron before making the cookies). Carefully lift the pizzelles from the grid (I slide a butter knife underneath them), split them in two and break off the square edges so you have a perfectly round cookie (do this while they are still warm). Continue in the same manner with the rest of the batter. When the cookies are cool, dust with powdered sugar (be generous). The Elegant Occasion Note: All pizzelle irons vary. Careful reading of instructions for your machine is recommended. Also, start with scant teaspoons of batter when you begin making the cookies. If you put too much, the batter will seep out the sides of the machine and make for a messy clean-up. If you use too little, you will not get a fully formed cookie (although they will still be delicious). I have learned through trial and error that two generous teaspoons on each grid work well with my machine and give me a perfectly formed cookie. But it does take a few tries to get the size exact. The Elegant Occasion Note: These cookies can also be shaped into waffle cones and cannoli shells. Simply roll the hot pizzelle immediately off the iron over a cannoli form. Remove the form after 60 seconds, and you have a perfect shell to fill as you wish.